From the author of We Are Called to Rise comes a novel about the interconnected lives of four women in Las Vegas, each of whom experiences a life-changing moment at a classic casino nightclub. What is it about the Midnight Room? In a choreographic tour de force, Laura McBride twirls four women through a Las Vegas nightclub, turning their separate lives into a suspenseful, intricate dance of mothers, daughters, wives, and lovers. The One Who Falls in Love: June hires a charismatic black man to sing at her club, but her fast-paced lifestyle runs aground as racial tensions mount. The One Who Gets Lucky: Honorata leaves the Philippines as a mail-order bride, then strikes it rich in the Midnight Room. The One Whose Heart Is Broken: Engracia finds bad luck in the Midnight Room and becomes enmeshed in Honorata’s secrets when she confronts a man with a gun. The One Who Always Wondered: Coral struggles with her mysterious past until a desire to help Engracia steers her to the Midnight Room. Wise and heartbreaking, jubilant and loving, ’Round Midnight is about the intensity and intimacy of four women’s lives, lives that are connected by secrets, courage, tragedies, and small acts of kindness. This brilliantly conceived, passionately written novel will resonate long after you turn the final page. "In the opening pages of Laura McBride’s new novel, June Stein dives off the Haverstraw Bridge and straight into the reader’s imagination. I love how June, and the vivid, complicated women around her, often fail to act in their own best interests while they still win our affection and admiration. And I love how McBride brings to life the fast-changing city of Las Vegas through their intertwined stories. ‘Round Midnight is a passionate, gripping and beautifully written novel." "Laura McBride reminds us of the invisible threads that bind us together as she weaves the stories of four very different women into a haunting tale of love, loss, and the power to endure. A compelling, transporting, and deeply wise novel. I was enthralled from the first page. Laura McBride is a stunning storyteller." 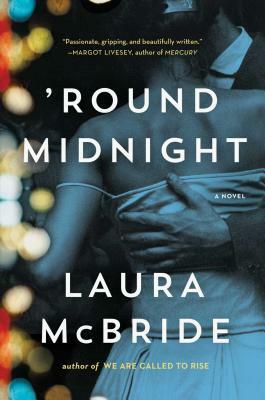 "I’m not one to pull out the term “Great American Novel,” but Laura McBride’s sublime ‘ROUND MIDNIGHT demands nothing less. Gorgeous, engrossing, moving, and at times wickedly funny, this brilliant novel pulled me in and didn’t let me go until the shattering final sentence. This is the novel you need to read right now." "[A] jewel of a nov­el. Haunting and unpredictable, ’Round Midnight is the beautifully told story of how fates intertwine in ways we can’t plan." "A dangerous romance and a captivating character make "Round Midnight memorable...illuminating...thrilling...heartbreaking...You'll fall in love." "When Laura McBride starts a novel, her characters lead the way as she writes." "It's not often that a work of literature is able to move its readers to slow down and savor its signifigance, coaxing them into prying open its complexities one by one with a sense of wonder and anticipation. Equal parts intricate and graceful, 'Round Midnight accomplishes just this." "Redemption in doing the right thing, the solace of accepting fate, perhaps, echoes through 'Round Midnight. McBride crafts passages of sterling imagery and diction....Mostly, though, she tells an honest Las Vegas tale about life and fate, with characters, not caricatures." "A beautiful novel about families and love and complications of human relations....Superb." "Through outstanding character development and beautifully crafted storytelling, McBride uses the stories of four seemingly insignificant women to weave her tale into the readers' heartstrings." "If McBride is trying to prove what one of her characters declares--that if you change one life, you change the world--she succeeds magnificently....McBride powerfully addresses an important theme, namely, how much a personal choice can impact others and even alter history." "Laura McBride braids a compelling, heartbreaking narrative of four women--June, Honorata, Engracia and Coral--whose lives are transformed by the El Capitan....McBride is skilled at handling multiple narrative threads, but more simply, she knows how to do what Vegas does: lure a passerby in, hook them with a good story and leave them wanting more."